Winter is not my favorite season, but it is full of my some of my favorite books. 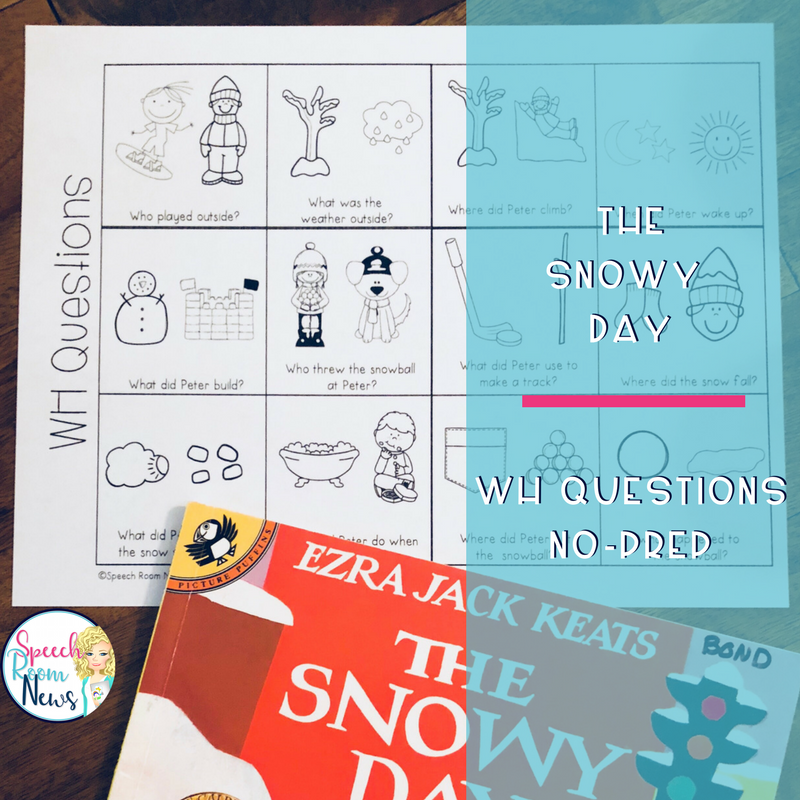 The Snowy Day by Ezra Jack Keats is that I use every year. 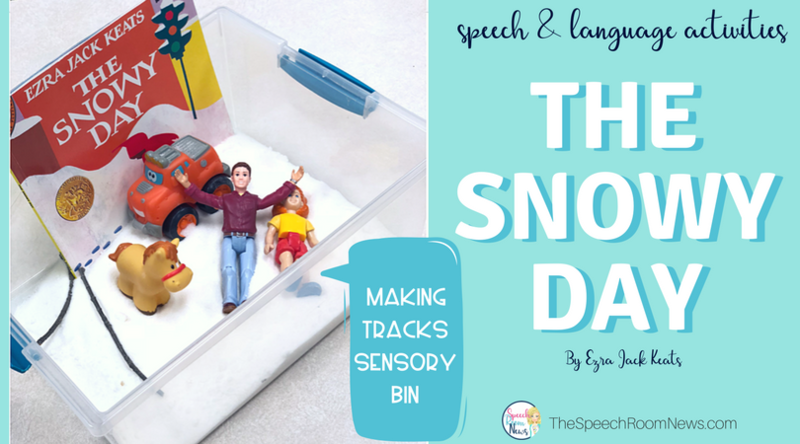 Here’s a peek at some of the speech and language activities I use with the book. Start with reviewing the book. It’s a short read, so I do it with every group and I can finish it quickly. When I’m reading, I’m eliciting s-blends galore (snow), work on pronouns (he,she), and do a lot of inferencing work. This book is great for helping kids make a picture in their minds. Imagine what Peter is doing to make regular tracks, tracks that go out, tracks that go in, long line tracks, and tracks with a stick. Those visualizing skills are critical for language development, reading comprehension, and executive functioning. 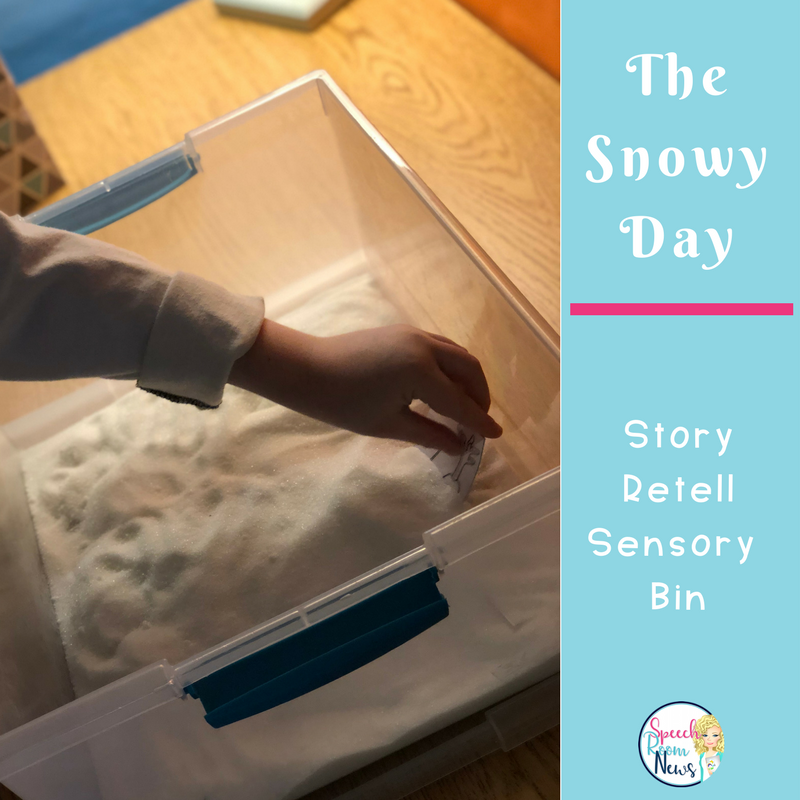 After we read the book we used a sensory bin full of sugar to pull out pieces of the story. After we removed them from the sugar bin, we sequenced them. For most of my preschool kids, I reduced the sequence down to 3 parts and we did the book part by part. I can check vocabulary, comprehension, recall and WH questions with this task. My phonology students used a carrier phrase that matched their speech goal to elicit lots of practice (I found, I spy, I got, etc.). 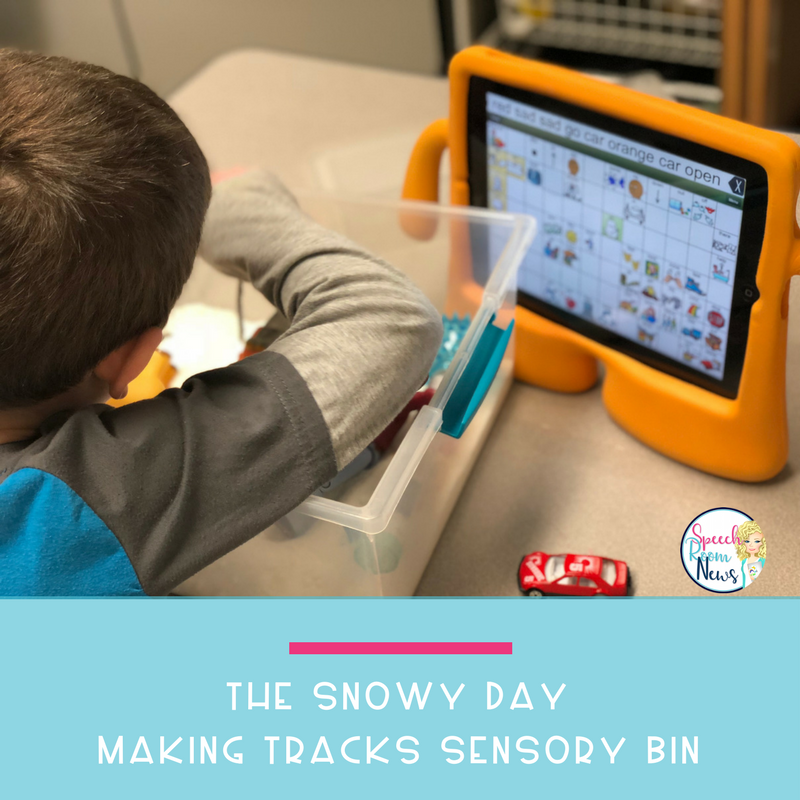 After the sugar sensory bin was empty, I put a boy, girl, truck, and sticks into the bin and we made tracks! We recreated the book scene, where Peter walks and then walks with his feet dragging. We did same/different and described the tracks. Then we used other things like the truck to make tracks. We talked about the size of the tracks and used comparative words. Then we used the boy and girl to work on pronouns while walking through the snow. 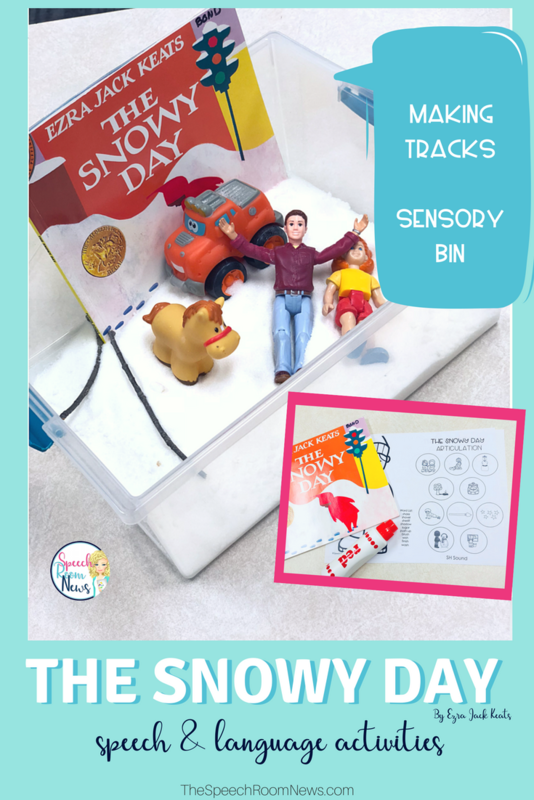 For my student working on verbs, we made up different actions for the characters to do in the snow (walk, run, slide, jump, dig, etc.). We did some follow-up WH questions with my WH questions worksheet to check comprehension. We played with a game board that highlighted the story vocab. We practiced using it in sentences. 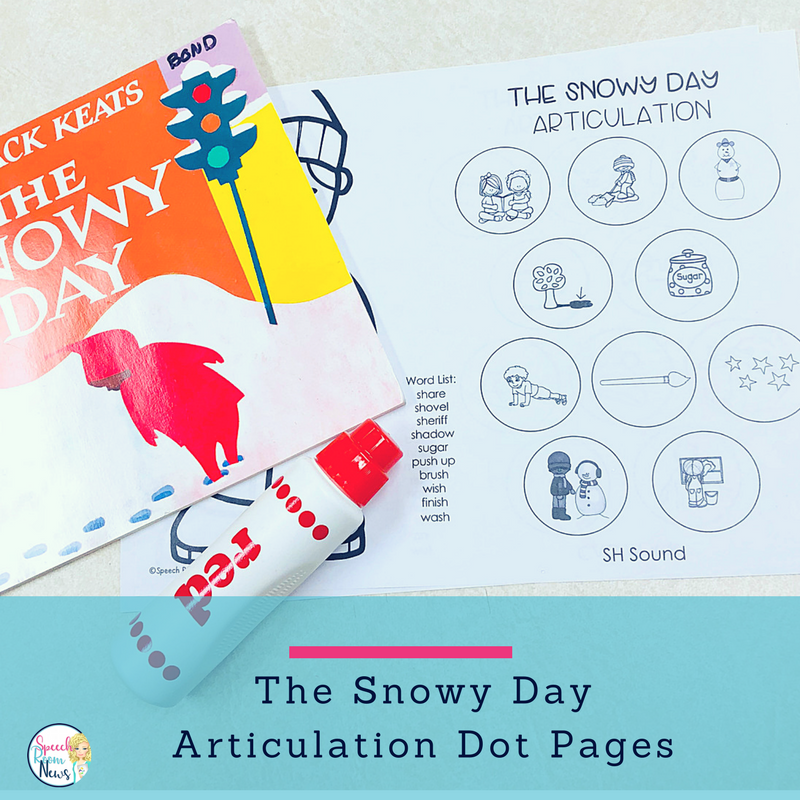 Lastly, we used dot markers to cover snowballs with phono and articulation words on them! It was a great unit. 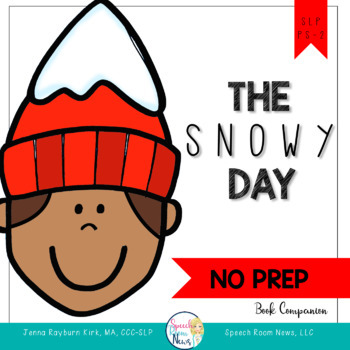 You can grab my no-prep Snowy Day book companion here in my store. Save this idea for next winter by pinning this image on Pinterest!